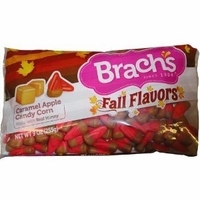 Brachs Caramel Apple Candy Corn fall flavors. One bite into this candy corn and you will taste a Macintosh apple with a mixture of caramel. Each kernel of corn is red and brown instead of the traditional orange and yellow. I have to admit I was surprise at the great flavor, it was almost as if I was really eating a caramel apple. If you haven't tried these and enjoy apples and caramel they are worth trying. 9 oz bag.